Trump choice to oust Tillerson made "by myself"
Asian markets tumbled on Wednesday as news that Donald Trump had replaced his moderate secretary of state with a hawk fanned fears of instability in the White House and a more hardline approach to foreign affairs. News that Rex Tillerson had been sacked rattled US equities, which had been buoyed earlier Tuesday by a soft inflation report that tempered talk of a sharp rise in interest rates. The former oilman had been seen as taking a more pragmatic line on various issues, particularly on global trade and the Iran nuclear agreement. He will be replaced by CIA chief Mike Pompeo, who is an advocate of taking a hardline with China on trade and Iran. 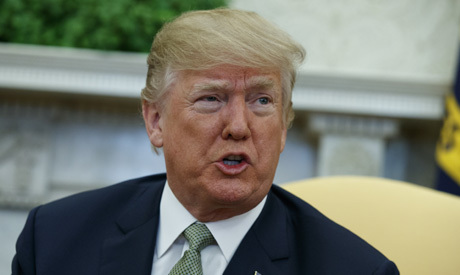 Adding to the unease on trading floors were reports Trump is considering hitting China over alleged intellectual property theft, with an announcement on tech sector tariffs said to be lined up for as soon as next week. "The significance of a shift to a global trade and foreign policy hawk with the US on course for a trade showdown with China and diplomatic negotiations with North Korea, is very significant suggesting the US is readying for hardball negotiations," said Stephen Innes, head of Asia-Pacific trading at OANDA. The move, which had been expected in some quarters, comes after Trump's pro-markets top economic advisor stepped down this month over controversial metals tariffs. Tillerson marks the latest in a string of senior members of the administration to resign in 14 tumultuous months and reinforces a sense of uncertainty on Pennsylvania Avenue. "Markets one day may become exhausted if the staff turnover and perceived White House instability continues," Terry Haines, a senior political strategist at Evercore ISI, wrote in a note. "Trump and the administration will have some work to do to reassure markets." All three main US markets ended lower and Asia followed suit. Tokyo fell 0.9 percent, while Hong Kong shed 0.5 percent and Shanghai sank 0.6 percent. Sydney lost 0.7 percent, Singapore fell 0.5 percent and Seoul was off 0.4 percent while Wellington, Manila and Taipei also fell. The news overshadowed data showing US inflation eased in February from January, which helped to wind back concerns that the improving economy was pushing the Fed to lift borrowing costs four times this year rather than the three earlier thought. Those figures, combined with the Tillerson sacking, sent the dollar lower against the yen and pound, with sterling also getting support from improving British economic forecasts. And on Wednesday traders continued to sell the greenback against all its major peers as well as most high-yielding currencies. "The dollar sell-off can be attributed to the combination of lower (inflation) and the White House revolving door syndrome that exudes little confidence in the administration," Innes said, adding that "the moves in equities suggest investors are bracing for more worrying protectionist headlines". In early European trade London and Paris each dipped 0.1 percent, while Frankfurt was flat.